In 2007, frequent collaborators Robert Rodriguez and Quentin Tarantino released a double feature called “Grindhouse” - a homage to the same named genre of B-movies that dominated drive-in theaters of the 1960s and 70s. While the filmmakers worked together on each portion of the project, Rodriguez was the director of “Planet Terror” and Tarantino took the reins for “Death Proof”. The pair of movies are not directly related in their plots, but are intended to be watched together in order to simulate the experience of the so called “grindhouse” cinema, even including fake trailers and advertisements between the films. “Death Proof” stars Kurt Russell as an aging Hollywood driver named “Stuntman Mike” who rides around in 1970 Chevy Nova, which is “death proof” . . . for the driver. The film consists of two separate instances of Mike attempting to murder young women in car accidents that he sets up; the first taking place in Austin, Texas and the second in Lebanon, Tennessee. In the later half, Mike ends up driving a 1969 Dodge Charger as he is pursued by a tough gang of girls that decide to fight back with a vengeance. As I have worked my way through this marathon of Tarantino’s filmography, I am yet to doubt his vision as a director and can confidently say that this remains true with “Death Proof.” Simply put, in each of his projects, it is quite evident that Tarantino made the movie exactly the way he wanted to. cinema, particularly this specific muscle car segment of the genre. In order to add extra effect and emulate the time period, Tarantino used many jump cuts throughout and physically scratched the film to achieve a dirty, grainy look. Between the obnoxious, over-the-top story, ridiculous chase sequences and overall film style, it is clear that Tarantino didn’t want to make a groundbreaking masterpiece here (for once). 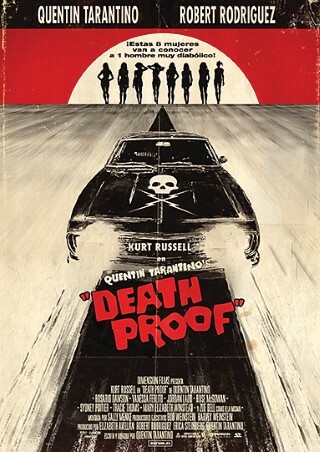 That being said, “Death Proof” is a lot of fun for what it is, highlighted by an amusing performance from Kurt Russell and a couple of long, entertaining chase sequences. However, this is not a movie I’ll be rushing to watch again, as it is simply not on the superior level of storytelling quality as the rest of Tarantino’s work. From my interpretation, “Death Proof” is all about this time-machine like experience of simply having a couple hours of fun with an intentionally not-so-good movie. Tarantino changed direction quite a bit in 2009 when “Inglorious Basterds” was released; watch out for my thoughts on that soon.